In addition to obtaining advice from your financial advisor, performing your own due diligence is a first step to investing. Beyond the Mortgage Investment Corporation’s (MIC) own publicly available information, it’s prudent to look at external, unbiased sources of information to get a clear view of where exactly you are putting your hard-earned capital. In our previous post, Investor Tips: Selecting the Right MIC, we focused primarily on information that the particular MIC provided: offering memoranda, subscription agreements and associated fees, liquidity, portfolio composition, how dividends are distributed, frequency and transparency in reporting to shareholders, etc. With that context in mind, this entry looks at building a more complete picture of your potential investment by looking at external sources of information. 1. Canadian Mortgage and Housing Corporation (CMHC) – CMHC has a superb collection of data that is regularly updated and analysed by leading economists. Of particular interest to investors is the Housing Market Information section of the website: included are data sets and reports that range in scope from the national housing market to more local housing markets to even more granular neighbourhood details. You can use the information here to evaluate the MIC’s lending policies against your own appetite for risk. For example, you notice that a sizable chunk of the MIC’s portfolio is allocated to higher risk rural properties. Using CMHC’s data sets, you can see that the market outlook for these regions is not ideal. While the potential return is high, you decide it isn’t worth the risk and continue your search. CMHC’s housing portal is an invaluable resource used at all levels of the industry. Best of all? It’s free. 2. 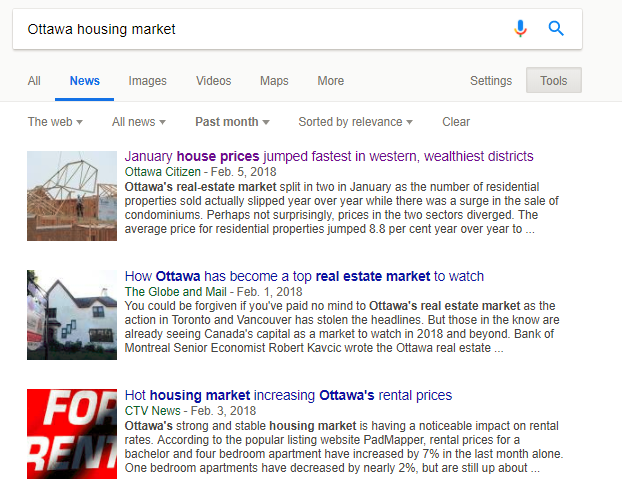 National and Local Publications – Using a keyword search into Google’s handy News filter is a great way to get a feel for how the housing market you are interested in is performing. For example, “Ottawa Housing Market” pulls up plenty of relevant articles from reputable sources. You can even set a custom Time filter via search tools to focus your research on a specific time period. While National publications such as the Financial Post or The Globe and Mail do a fantastic job of covering broad housing market news, they are inherently focused on only the big stories (read: major urban centres such as Toronto, Vancouver, and Montreal). It’s important to go to local sources for specific details on a given market. 3. Statistics Canada – While slightly less focused than CMHC’s or CREA’s analysis, Stats Canada has a breadth of information on housing and other indicators of economic growth to help inform your decision. Pro tip: use Google to search for region specific data sets. StatsCan’s website is notoriously difficult to navigate. 4. Trade Publications – Websites such as Mortgage Broker News and Canadian Mortgage Trends offer a lot of insight into how professionals in the industry are reacting to industry changes and new MIC products. 5. The Canadian Real Estate Association – CREA provides monthly updates on home sales and home prices for a given housing market. Once you’ve navigated to their statistics page, select the community you want to research and a report for the previous month will appear. Along with the tools above, this helps create a full picture of where a potential MIC would be lending your capital. These are just a few resources to help jumpstart your own research. The basis for any investment decision needs to be rooted in a fact-based, methodical approach to understanding an investment product. Established in 1994, Magenta Capital Corporation (MCC) is one of Canada’s oldest and largest Mortgage Investment Corporation (MIC) managers. MCC sources, underwrites and manages a portfolio of primarily residential first mortgages, secured by properties located in Eastern and Southwestern Ontario, two of the strongest, most recession resistant real estate markets in the country. MCC has a 23-year track record of generating superior returns for the shareholders of Magenta Group MICs. MCC exercises oversight responsibility for the Magenta Group MICs in its capacity as General Partner of three limited partnerships, each of which is wholly owned by one of the MICs. For more information, please visit Magentainvestment.ca.